The German techno body music duo have released music on [aufnahme + wiedergabe] and Fleisch, and have performed everywhere from London to Tokyo. We happily announce their Budapest debut with a live show on 26 January at LÄRM. Schwefelgelb’s music incorporates the sounds of EBM, techno and electro. Since their first album in 2008, what remains constant is an unrelenting pursuit of grimy, hard-hitting dance music, a return to early digital and wavetable synthesis. Sid and Eddy’s recent EPs ‘Dahinter Das Gesicht’ and ‘Aus Den Falten’ deepen their signature aggressive take on techno on the edge of modern industrial perspectives and classic EBM sounds. Their music has been played by the likes of Helena Hauff, Silent Servant (Official) and Tommy Four Seven. In addition to their performance, we are also looking forward to Schwefelgelb’s remix for the notable Hungarian label Dalmata Daniel on Cardopusher’s ‘Flesh Impact’ EP, which will be released in spring. 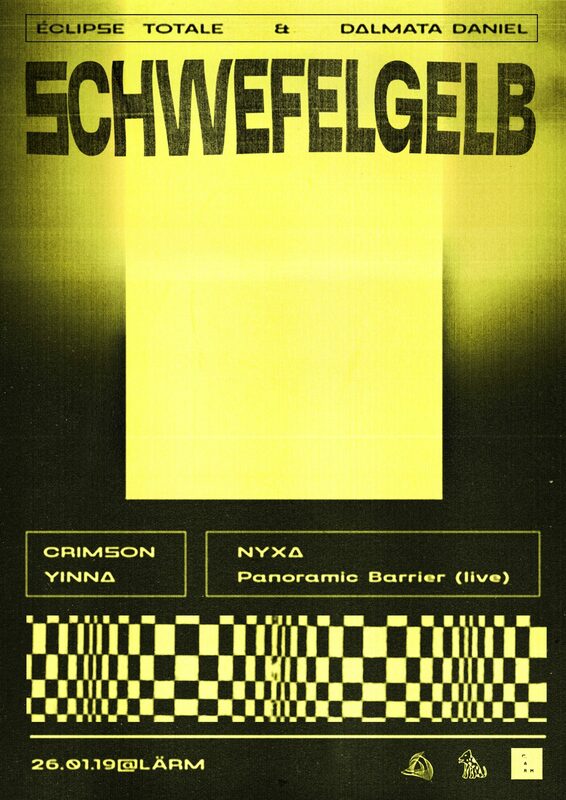 The night will be supported with another live set by a key artist of our local industrial and EBM scene, Panoramic Barrier and DJ sets from the highly versatile vinyl lover DJ Crimson and the Éclipse totale residents Yinna and NYXA.